The Credit Report Import Tool is one of our greatest features. **Just remember, this is technical, it requires certain tools (all free), certain steps (watch the videos) and it will take some practice. If you’re new to Credit Repair Cloud and have difficulty with importing reports, just click here to schedule a phone session so we can help you personally. We are here to help. First, have your client order their own credit reports (for $1) and share their login details with you. Yes, it’s that simple. I know you’re thinking “Can’t I just order the reports for my client?” Unfortunately, the answer is no no no! These are consumer services only. There are privacy issues. So please have your client signup themselves, pay the $1 for the free trial and share the login details. Then, let the client decide if they want to keep the monthly credit monitoring service or not. But be sure to remind them that The only way that a person can see their new scores each month is to pay for a credit monitoring service. It’s a necessary part of the credit repair process. Want to learn more about ordering credit reports? Click here. They each have a $1 trial with instant access to reports and scores from all 3 bureaus. That’s a real bargain for your client. Just remember that your client must be the one who signs up. The report providers DO NOT want you ordering reports for your clients. Now lets Import an Online Credit Report! 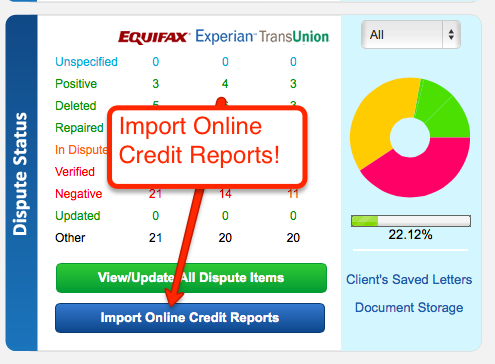 Log into your client’s dashboard, click on IMPORT ONLINE CREDIT REPORTS and then follow the steps in the page. You must use the newest version of Google Chrome and the Enable Right-Click Extension for Chrome or it will not work. ARE YOU IMPORTING FROM IDENTITYIQ? Importing a Credit Report can be frustrating! The difficult part happens on another company’s site (not ours). Viewing/copying source code requires advanced computer skills. Just take it slow and practice with your Sample Client and Sample Report and watch the videos. Not clicking the link to “view full report” in one long page. Not using the newest version of Google Chrome. **Again remember: Importing a credit report is technical: it requires certain tools (all free), certain steps (watch the videos) and it will take some practice. If you’re new to Credit Repair Cloud and have difficulty with importing reports, just click here to schedule a phone session so we can help you personally. We are here to help. What if your client gives you a report that isn’t one of these listed? Don’t worry! Watch the 2nd video below. Here are two video guides that show step by step how to import a credit report. This will be 5 minutes well spent! How do I update a client’s report? Should I re-import a new credit report after changes happen? If you’re using the import tool, you’ll want to import fresh new credit reports each time you start work with a new client, but importing a second time for the same client is not necessary and will cause extra work. Also, if you were to import again for the same client, you must always use the same provider. Otherwise you’ll have duplicate items. A few weeks (or a month) later, the bureaus will send your client a letter notifying them if items have changed status. Be sure to have clients forward all these letters to you. At that point you “could” import again, but it’s easier and faster to visit the “Dispute Items” page and just click on the items that changed. This will update all the records in the software and the client portal. Still need extra help? Schedule a Free Session with an Expert! This is FREE for all new Credit Repair Cloud account owners. *This is for software assistance only. No legal or credit repair questions please.